Do horse owners become desensitized to signs of poor wellbeing? Have horse owners become so used to signs of poor wellbeing in their horses that they no longer recognise the signs? A study suggests that may be the case. Caregivers are not terribly good at detecting undesirable or abnormal repetitive behaviors in their horses, French research has shown. Animal behaviorists Clémence Lesimple and Martine Hausberger found that caregivers tended to strongly underestimate horses’ expressions of wellbeing impairment. Lesimple and Hausberger, from the University of Rennes 1, said research had shown that healthcare practitioners such as physicians or nurses also often underestimated patients’ wellbeing impairment, such as pain and anxiety. They set about comparing the ability of equine caregivers’ to assess horses’ expression of poor welfare – abnormal repetitive behaviors and stereotypic behaviors – which are recognized as signals of welfare impairment. Stereotypic behaviors include weaving, cribbing, box walking, compulsive licking and compulsive biting. The assessment of each caregiver was gleaned through a questionnaire, which was then compared to the findings of an experienced animal behaviorist, with a doctorate in the area of horse welfare, who spent 18 hours observing the horses in each stable. “Caretakers strongly underestimate horses’ expressions of well-being impairment,” Lesimple and Hausberger, writing in the journal, Frontiers in Psychology, concluded. They found that caregivers with the strongest concerns about their horses’ wellbeing were more accurate at reporting the prevalence of undesirable and abnormal behaviors in their horses. However, overall, the caregivers showed poor ability to identify the signs. The experienced observer noted that 37 percent of the horses – 140 animals – expressed at least one undesirable or abnormal trait. 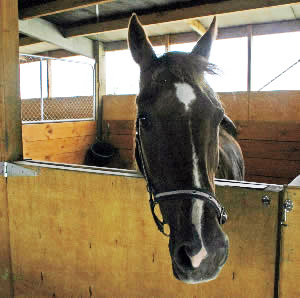 By comparison, the caretakers reported just 21 of the horses – or 5 percent – showed such traits. The authors described the difference as a “very large discrepancy”. Long exposure to the animals appeared to be a factor in people being unable to see the problem behaviors, the authors said. In one set of stables, no undesirable or abnormal repetitive behaviors were reported, where most of the horses were seen to be exhibiting them by the experienced observer. “Being surrounded by a large population of individuals expressing clear signals of ‘bad-being’ may change professionals’ perceptions of what are behaviors or expressions of wellbeing,” the authors suggested. Their findings supported their hypothesis that horse caregivers, like human healthcare practitioners, underestimate horses’ expressions of discomfort, even though these expressions may be visible. Overexposure to horses showing the abnormal or undesirable behaviors leading to lowered sensitivity – in other words, the abnormal behaviors observed may somehow become the standard. The study involved 373 horses, comprising 212 geldings, 159 mares, and two stallions, aged 3–34, of various breeds across 26 riding schools all over France. The horses were under the management of the riding schools, housed mostly in individual boxes/stalls. Most were fed pellets (93 percent), one to three times a day, while 13.7 percent had no concentrates. Most – 89 percent – had hay distributed in one to five meals. The horses worked 4 to 20 hours a week in riding lessons, involving mostly children and teenagers, with one day off a week. The authors acknowledged it was possible that some people may have been reluctant to report behavioral problems in their horses as they are known to occur under sub-optimal conditions, although they considered this unlikely. They said the underestimation of wellbeing impairment by caregivers was worrying as they may lead to inappropriate or insufficient treatment decisions. It was worrying that over-exposure may ultimately blunt caregivers’ ability to see the subtle signals of poor wellbeing, they said. “Indeed, whether in the context of human medical care or animal welfare, the underestimation of bad-being signals can lead to inappropriate treatment or management, with possible serious consequences.